This is one of the best things I've seen in ages. It's a Google Maps mashup that shows the amenities (bars, restaurants, parks, bookshops, grocery shops etc) local to any address, and then calculates a 'Walkscore' - how much stuff is within walking distance. It seems to work fo r all countries where Google Maps works. So effectively it's a proxy of a fun index. For example my parents' house has a score of 12%, while my flat has a score of 68%, and my office near Covent Garden has a score of 92%. It also now finally visualises my statement of how many bars, restaurants, takeaways etc there are near my flat. It would also be vital for house hunting, given your lifestyle and how much of a wild time you want to have in your new home. It's no doubt that walk score is convenient, but nowadays more and more people drive cars and they are interested also in drive score. I've found this type of service on www.fizber.com. Drive Score shows a map of what establishments are in a property’s neighborhood and calculates a Drive Score based on the number of places within a convenient driving distance. Homes are often located in an area where restaurants, libraries, grocery stores, hospitals and other businesses are easier to get to by car than on foot. Thanks for the article. That's really cool. And thanks for the last comment with one more link. 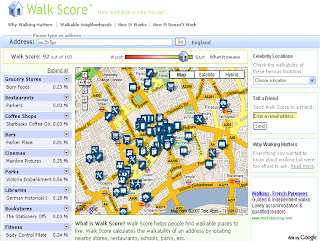 I've spent about an hour entering different home addresses and estimating their walkscore and Drivescore.